Despite a slightly dense UI this is an excellent, forward-thinking synth - and possibly the best use of MPE technology we’ve tried. Excellent stock of MPE presets. Interface feels dense and monotone. Like its sister-instrument Strobe, the original Cypher started life as part of FXpansion’s three-instrument DCAM Synth Squad package. A near decade later, we now have a standalone sequel that builds on the concept of the original in some fairly forward-thinking ways. At core, Cypher 2 is an analogue-style subtractive synth. Its sonic USP, however, comes from the complex, audio-rate modulation options offered by its oscillators. To this end, it offers up three oscillators each with a continuous wave shape control and flexible frequency modulation options allowing the trio to be routed to one another’s pitch in any combination. There are also options for oscillators sync, ring modulation, white and pink noise and audio-rate sample and hold. The oscillator section is rounded out by an Analogue Noise generator, which simulates mains hum and circuitry noise. The signal then heads to Cypher’s Filter/Shaper section which offers dual multimode filters and two ‘shapers’ which each offer a range of distortion and wavefolding effects. Along with standard analogue-style modes, each filter also offers a variety of comb filtering modes. Cutoff can also be modulated by Osc 3, for further audio-rate modulation effects. This combination of elements gives Cypher 2 a broad scope of sonic potential. It can do bread-and-butter analogue emulations well but it really excels at slightly more esoteric, inharmonic sounds created through complex modulation and waveshaping. It’s at its best when these two aspects of the synth combine, creating classic synth sounds layered with interesting textures and FM-style effects. Since the original’s release, its creator FXpansion has been purchased by Roli. Unsurprisingly, then, one of the major updates for Cypher 2 comes in its readiness to work with ‘multi-dimensional’ MPE control inputs. This means that, along with 800 ‘standard’ preset, Cypher 2 comes with a generous 500 extra ‘5D’ presets, mapped to allow complex modulation and expression on a note-by-note level. Kudos to FXpansion’s sound designers, the MPE-ready presets are excellent; the sounds themselves, as well as the modulation routings, really suit the hands-on, expressive experience of playing with an MPE controller. It makes Cypher 2 particularly great for expressive ambient pads and delicate textural synth sounds. In fact, the whole design of Cypher 2 lends itself to expressive sounds, whether used in MPE mode or not. Alongside the synth engine itself, it offers a lot of very interesting modulation options, including multiple LFOs, envelopes, ramp generators and flexible matrix of routing capabilities. 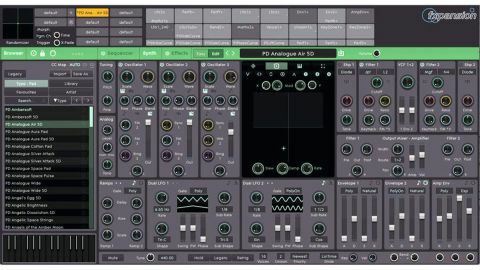 An interesting ‘5 dimensional’ sequencer offers multiple modulation channels reminiscent of working with a complex Eurorack setup, albeit in digital form. The nod to the world of modular is further extended with Cypher 2’s Maths processor, with its variety of multiplication and division-based modulation tools. Finally, a Euclidean processor gives a cool, esoteric modulation source based on geometric shapes controlled via an XY pad. Where Cypher 2 does have a weak spot is in its rather one-note interface design - making it feel dense and a little busy, while usable. That aside, this is a sonically impressive synth with lots of forward-thinking sound design tools. It’s possibly the best MPE-ready instrument we’ve tried too. For owners of Roli Seaboards or other MPE devices, this is pretty essential. There’s a lot here for any producer though, particularly if complex textures are your thing.